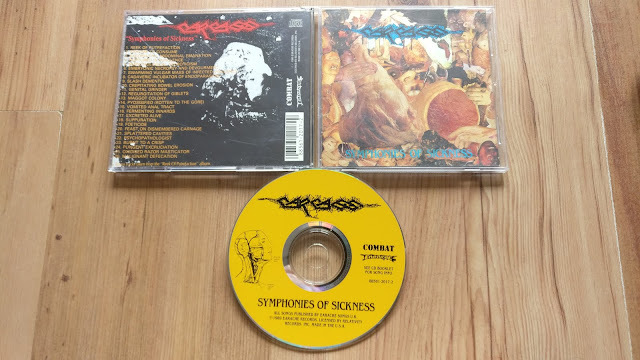 Carcass' 2nd album here; where they kept their grinding edge but moved away from the carcinogenic & atonal distortion blistered mess that was their debut, to something with more palatable structuring and songwriting. This pressing is the most interesting thing for me, as it's a joint release between Combat Records & Earache (the first US pressing of it, I believe). Not a particularly easy to version find these days. As is evident, this has the original artwork intact, too. Carcass are still the daddies of pathology/gore inspired metal to this very day.